Since 1930, Kobelco has built its excavators to be industry leaders, adding innovation to its machines at every turn. This attitude led Kobelco to develop the first short rear swing excavator, a demolition machine with the longest reach in the world and exclusive features such as no-time-limit power boost, independent travel and an ultra-quiet iNDr cooling system. Kobelco currently offers a full range of crawler excavators in the 3,000- to 245,000-lb classes, including zero tail swing, compact, standard, long-reach, mass excavation and demolition models. Eight of these models fall under the 8-metric-ton range. Kobelco mini excavators pack full-size performance into a portable package. A minimal rear swing radius with zero tail overhang allows for handling in confined spaces, while a simple design makes routine maintenance easy to undertake. The Kobelco mini excavator line is currently comprised of six models with operating weights between 3,836 and 11,860 lbs. The smallest of Kobelco’s excavators is the SK17SR. Popular on jobsites where equipment needs to be moved through tight spaces, the SK17SR features hydraulic side frames that retract to a narrow 37 in. for tight areas and extend to a solid 50 in. for stability. The SK17SR combines its compact design with performance, boasting a maximum digging reach of 12 ft, 2 in. and a digging force of 2,833 lbs. Kobelco’s SK25SR, SK30SR and SK35SR deliver a bit more muscle for heavier-duty digging and lifting. These models boast stability and provide a zero tail swing radius for jobs where space is limited. Often used for loading, placing and dozing across a wide range of applications, the SK25SR, SK30SR and SK35SR feature powerful digging forces and impressive reach at ground level. And, excellent side-ditch digging performance allows the operator to concentrate on the work in front of them for greater efficiency. The final models in Kobelco’s mini excavator line are the SK45SRX and SK55SRX. These Tier 4 Final excavators pack plenty of power for hydraulic performance. An integrated flow pump system delivers fast and smooth operation while raising the arm and boom — even during heavy loads. And, an automatic two-speed travel feature ensures smooth and efficient travel on the toughest jobsites. The SK45SRX and SK55SRX also feature Kobelco’s optional four-way blade, which delivers a left- and right-angle movement of 23 to 25 degrees for increased operator control during clearing, grading and backfilling. Additionally, Kobelco’s 17,100-lb SK75SR and 18,700-lb SK85CS SR Series models are packed with value and innovation and incorporate fuel-saving technologies. 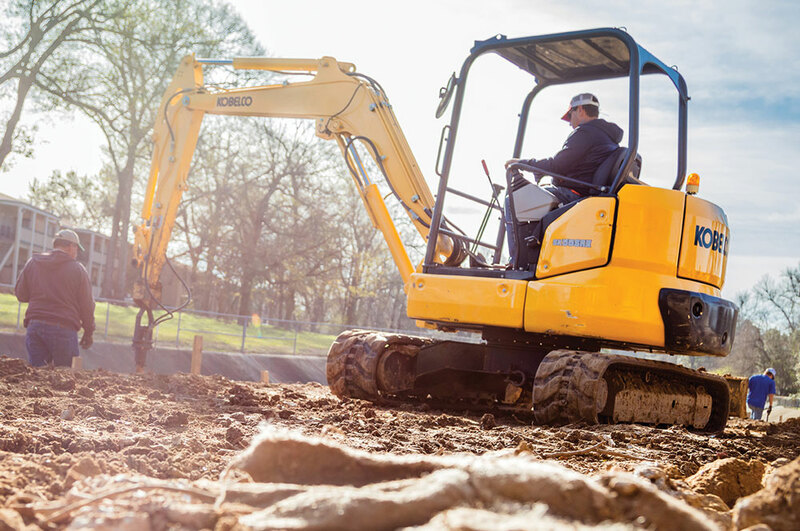 An 11.5-rpm swing speed on both the SK75SR and SK85CS provide short cycle times for enhanced productivity, and a powerful travel motor makes moving these excavators around the jobsite a breeze. Learn more about Kobelco here.